The City of Mequon installed a new two story below grade pre engineered flooded suction sewage pump station as part of a system upgrade that included a new force main. 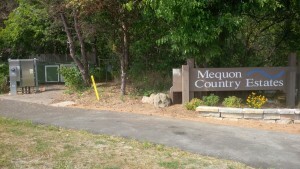 The City of Mequon, AECOM, and USEMCO were presented with unique criteria of needs and conditions that resulted in a double deck package lift station. The existing lift station was located between a residential subdivision, the Milwaukee River and State Hwy 167, a major thoroughfare through the City. Constructing the new lift station at the existing location posed problems due to the small size and limited access of the existing lift station site as well as the need for the current station to remain in operation until the new lift station and forcemain were complete. 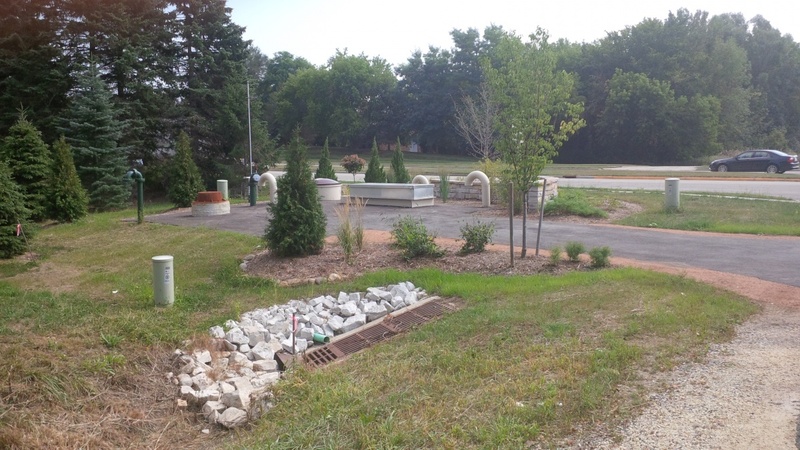 The proposed location of the new lift station had to be outside the right of way of State Hwy 167 (owned and maintained by Wisconsin DOT), but also close enough to utilize the existing generator and sewers. It was also necessary that the station be as unobtrusive as possible and shielded from view from State Hwy 167, the subdivision and Parkview drive. Given these constraints it was determined that a factory built below grade dry pit lift station would be the best solution to the city’s requirements. 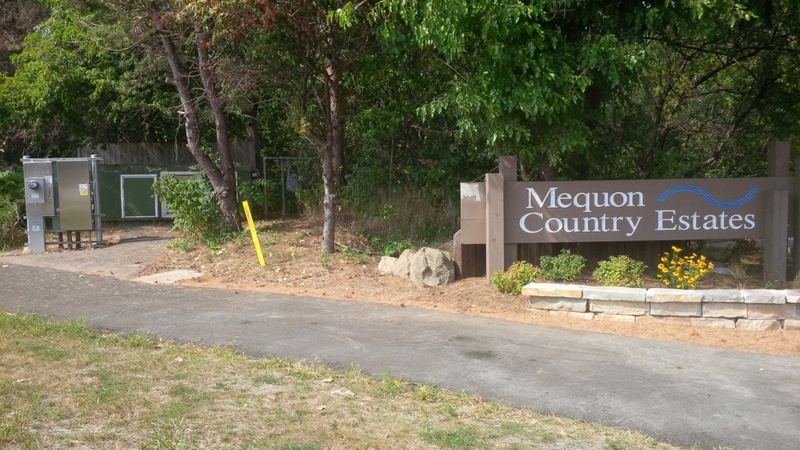 The City approached the neighboring subdivision association, and in particular the homeowner adjacent to the parcel east of Parkview Drive and north of the State Hwy 167. A small portion of the adjacent homeowner’s lot was then purchased to construct the new lift station without encroaching on the State Highway Right of Way. 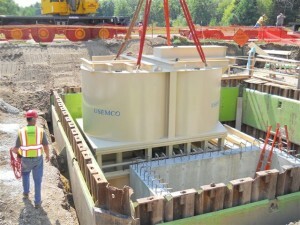 The entirety of the purchased parcel was utilized for the new lift station and access roadway. AECOM’s creative construction sequencing allowed minimal and shallow sewer work in Parkview Drive to be completed, concurrent with the proposed lift station excavation within the purchased property. 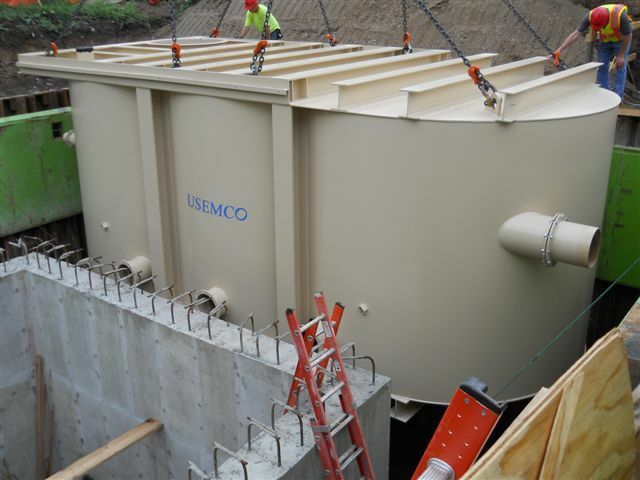 AECOM also insured that the electrical and control transfer was interchangeable between the existing and new lift stations, thereby allowing the City additional flexibility during the startup process for the new USEMCO lift station. Parkview Drive is also on a school bus route, meaning that the closure of this roadway had to be completed before school began in August 2012. 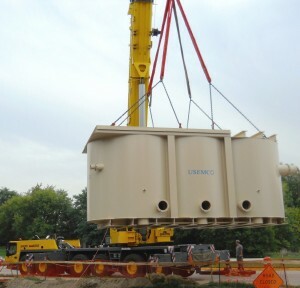 By choosing a factory package lift station the roadway was only closed for a period of 1 month to allow completion of the sewer work and installation of the new lift station. Since there was a very tight foot print for the new station AECOM and USEMCO determined that a double deck or stacked design would best meet the City’s needs. The complete station consisted of two separate chambers. A top chamber would house the controls and a bottom chamber the pumps. This accommodated the City’s desire to access the pump station control panel without climbing all the way down to the pump room which was approximately 24 feet below grade. 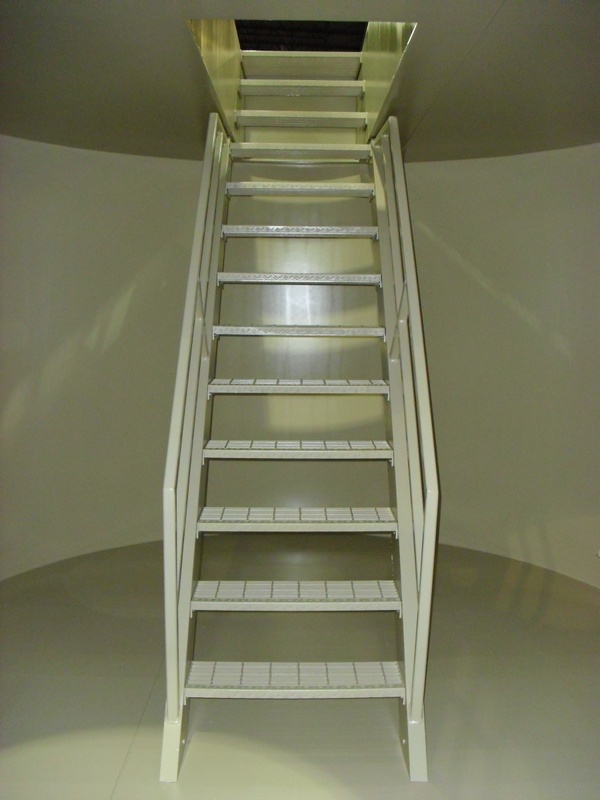 AECOM worked with USEMCO to design a control chamber located above the pump chamber that could be accessed via a regular stairway in lieu of a traditional entrance tube and ladder. The stairway design provided a safer easier way to enter the station and minimized the time it takes for the City’s staff to perform a check on the equipment. Moving the controls to the top chamber also reduced the overall length of the lift station thus reducing the amount of land requiring purchase. Both chambers had USEMCO’s curved wall or Peanut design that allowed for maximum interior room. 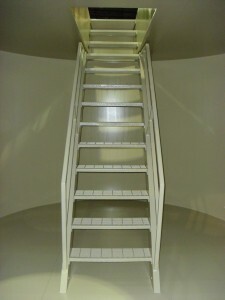 The bottom chamber is the pump room which is accessed thru a traditional entrance tube that is connected between the two units. 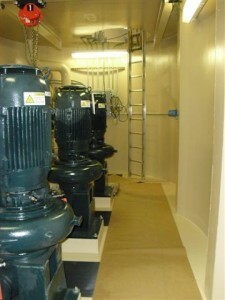 The pump room utilizes three Cornell 30hp eight inch pumps rated for 2000 GPM. A bridge crane in the pump room facilitates easy maintenance and is aligned with the service tube for equipment removal. AECOM’s design of constructing the new station across from the old station insured the existing access drive was able to be utilized for maintenance vehicles and access to the existing generator without parking on the shoulder. 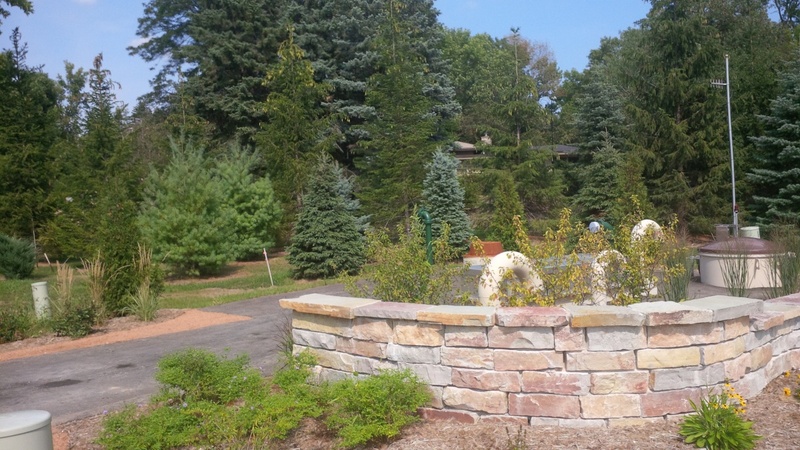 The new lift station has a decorative subdivision wall to shield it from State Hwy 167 and landscaping for additional shielding from the property owners and Parkview Drive. The existing lift station was then demolished and the block retaining wall removed, thereby restoring it to the same cross section as the remainder of State Hwy 167. The driveways to the existing generator and new lift station were repaved or newly installed to provide maintenance access to the facilities. 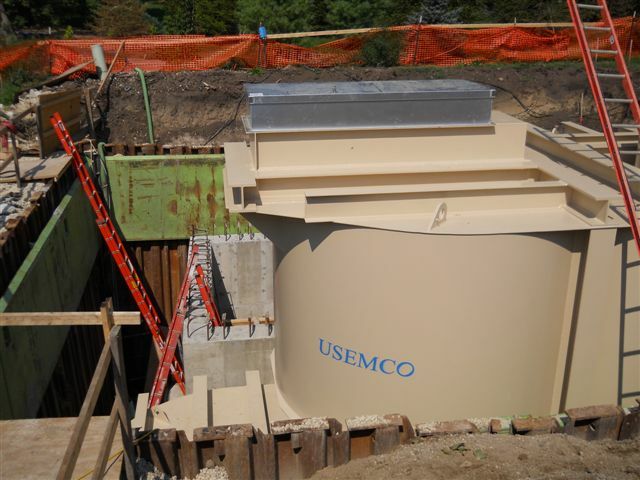 When Illinois–American Water Company needed a large booster station to meet contractual deadlines they selected USEMCO as their supplier. This project required one 300 HP and two 150HP Aurora vertically mounted split case pumps controlled by Variable Frequency Drives. The entire system is enclosed in a modular structure with an insulation rating of R30, aggregate siding, and a sloped roof that has three access hatches for pump removal. The size of the station was 15’10” wide x 43’ long and 15’6” high. The total skid length is 52’ including the attached 350KW generator for emergency power back up. The total unit weighed in at 90,000lbs. The station was shipped totally assembled and the tractor / trailer total length was 135 feet. With USEMCO’s factory testing this station only required external piping & power connections and the owners telemetry panel to be fully operational for immediate online service. 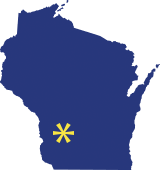 We are pleased to announce that American Water has selected USEMCO as its package station supplier thru 2006. 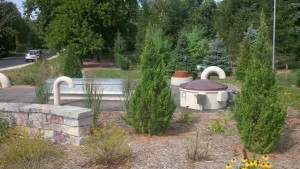 This agreement includes above and below grade valve and meter vaults. With a history of over 100 years, American Water provides high quality water, wastewater, and other related services. As part of RWE Thames Water, the Americas Region serves 20 million customers in 29 states, 3 Canadian provinces, Puerto Rico, and Chile. RWE Thames Water is the water division of international multi-utility RWE and is the third largest water and wastewater services company in the world. It serves almost 70 million people in over 20 countries. Additional information can be found at www.amwater.com. American Water and RWE Thames Water, through their combined expertise, continue the tradition of providing customers with superior quality service while gaining access to new technologies, research and development, and global experience in service, customer satisfaction and security. 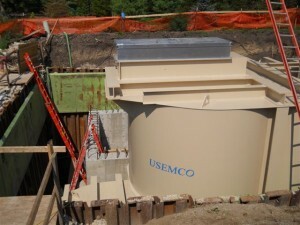 USEMCO was selected based on providing the best proposal to American Water. We look forward to working in partnership with American Water to provide the highest quality package systems with the most cost effective design.